When I was a kid in the '70s, family members would bring odd jello concoctions made with things like mayonnaise and frozen fruit, probably a 50s holdover. These, thankfully, have fallen into disfavor, and we never had green-bean casserole or marshmallow sweet potatoes. Most everything was made from scratch using fresh ingredients, including pies and goodies. I've continued doing the same as an adult. Well it sounds like a pie I would love. And actually if you added rice as an ingredient, you'd have rice pudding! The rest of the ingredients are basically the same. Love these family recipes, and it's a good thing grandma finally shared! Some sort of "salad" with mini marshmallows, apple slices, walnuts, raisins, and mayonaise. Gross. That might have been "Ambrosia", that was a popular sweet salad in the fifties and sixties. 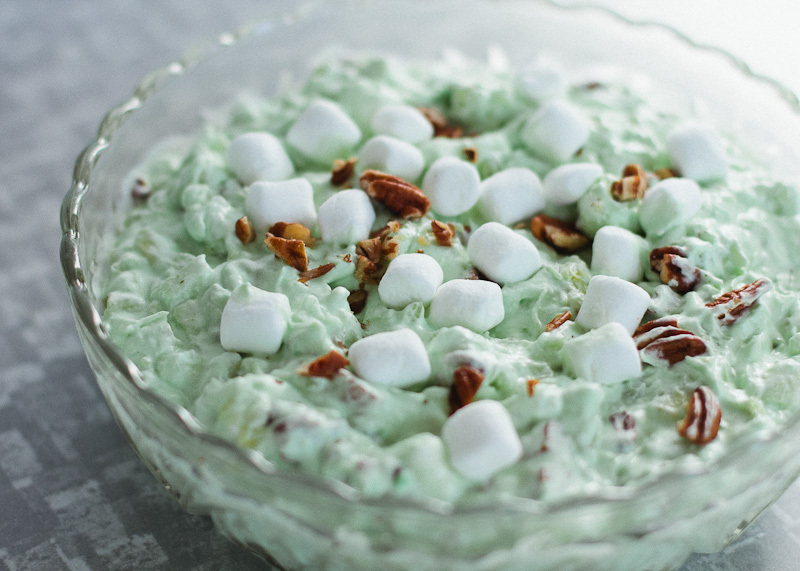 But yours might be more like a glorified Waldorf Salad....now that I think about it .."Ambrosia" had fruit cocktail, Maraschino cherries, pineapple, shredded coconut....mixed into Cool Whip and served as a salad. There was a green jello salad made with pistachio jello and fruit.....that was popular too. Last edited by elston; 11-18-2013 at 04:06 AM.. The problem, from what I have heard: jello is making a comeback. I do agree, my mom in law always made rainbow salad. It had a filling of cream cheese, canned fruit cocktail (which I have always hated) and I think melted marshmallows or something. Then she would make a jello, cranberry relish, she called it, plus of course the famous yams with all the sweet stuff. Maybe this is why I don't like hardly anything sweet on the dinner table except, of course, dessert later. The one dish that always comes back for our holiday table at Thanksgiving is thankfully one my family LOVES!! IT is a fruited cranberry jello. There's whole cranberries, apples, oranges and pineapple, sugar and 2 boxes of jello. I know the pineapple keeps it from getting solid, but that's the idea. It's more of a sauce type salad. Over the years we have cut back on the amount of added sugar and even my MIL who is extremely picky, has put in a request for this. For whomever asked a couple of pages ago, the answer on stuffing or no, is a definite YES!! I am a human garbage disposal that likes most anything, however, when people try to dress up the cranberry sauce by adding nuts, coconut, or orange rind, it makes it taste gritty with a nasty soggy-crunchy taste. Plain old fashioned sauce made with whole cranberries and sugar, please! Yes, may I have some more stuffing/dressing, please. Oh some cranberry sauce and a little potato salad would be nice if you have any. right up there with the green bean casseroll. Yuck!